It didn't take long to learn the routine. Spend the bulk of the day hiking, swimming, paddling, or vigorously turning the pages of a favorite book. Then, with the need for replenishment well developed, we'd head over to Lihue, Waimea, or Hanalei for a heaping giant-sized serving of shave ice. Welcome to delights, Kauai-style. Hawaii's "Garden Isle" is where people go to earn giant slurpings of refreshing shave ice. It's easy to work up a sweat, or work on a tan on Kauai. Its shores feature beaches for sunbathing, wading, body and board surfing, sailing and boating. A variety of rivers can be traveled in kayaks or power boats. 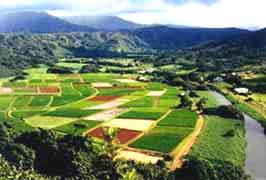 Kauai's mountains and north coast provide a variety of trails for sublime to spectacular day hikes or multi-night backpacks. A phalanx of helicopters fly daily circuits over the island, offering stunning views of Kauai's mountains, valleys, waterfalls, rivers and expansive fields of sugar cane and taro. Then after the lounging or sporting, Kauai's shave ice shops are ready to serve you their unique offerings for refreshment. Shave ice sampling No. 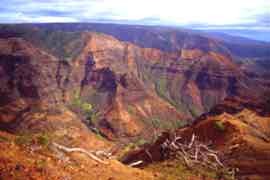 1 came after a day of hiking in Waimea Canyon, coined "the Grand Canyon of the Pacific" by Mark Twain. Grand it is. The canyon is 10 miles long, a mile wide and 3,600 feet deep. Overlooks speckled along the Waimea Canyon Road peek into the canyon or peer over nearly vertical cliffs to the Pacific Ocean. A good place to become oriented to Waimea's spidery web of trails and driving routes is the Kokee Museum, located at the road's 15-mile mark. The knowledgeable staff offers maps, books, suggestions and information on roads and trails. 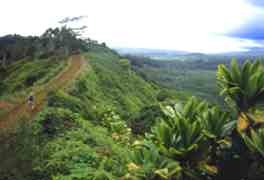 At their prompting, we drove to the road's end, the aerie-like Puu o Kila Lookout. We left the car and hiked the Pihea Trail to the Pihea Vista. 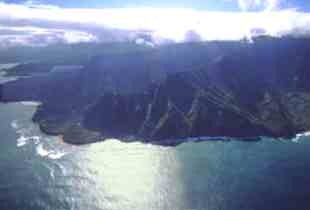 Along the way we gawked at ridges overlooking the expansively serene Kalalau Valley, the largest along the Na Pali Coast. Happily, we heeded good advice and began the hike early. By late-morning, when we were making our way back, clouds completely shrouded the view. Latecomers had no idea what they were missing. That afternoon we plunged into the cloud-free canyon, trekking the moderately strenuous Canyon Trail to Waipoo Falls and beyond. We lingered over the views, not returning until we had followed the wriggly trail to viewpoints that peered well into the canyon's depths. Shave ice cones in a rainbow of flavors Then, my wife and I made our first shave ice sampling at Joe-Jo's Clubhouse in Waimea. The hardest part was choosing a flavor from the 50 selections. Based on our survey, there isn't a bad choice. Joe-Jo's holds the island's consensus for the best shave ice. No, this isn't your father's snowcone. A sharp blade literally shaves ice from spinning circular blocks to create a fine powder that's compacted and covered with generous amounts of exotic fruit flavors. The tastiest, most decadent shave ice is formed atop a scoop of ice cream. My favorite? Rainbow, atop macadamia nut ice cream. Vying for a close second in shave ice offerings are Halo Halo Shave Ice in Lihue, near the island's South Shore, and Wishing Well Shave Ice in Hanalei, along the North Shore. 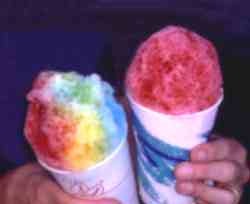 We slurped ices in the late afternoon at Halo Halo's, then walked a few feet to Hamura's Saimin Stand. We sat at an old-fashioned lunch counter and gobbled a low-priced, high-taste meal -- less than $10 for the two of us. It's a place where locals eat well. Before our Halo Halo-Hamura's stop, our day's travels included an easy but disarmingly beautiful hike on the Kuilau Ridge Trail. The first mile offers an easy incline through forested hills before reaching a grove of picnic tables with views of Mount Waialeale. We stopped, but only briefly. Only minutes later the trail follows a winding route along a razorback ridge, offering simultaneous views of the mountains and the Pacific Ocean. We never did actually see Awialeale's summit, but few people do. Awialeale lays claim as being the rainiest spot on earth, with an average 440 inches a year. The Wishing Well shave ice works best after some time along the Na Pali Coast, an 11-mile stretch of strikingly wild northern coastline. 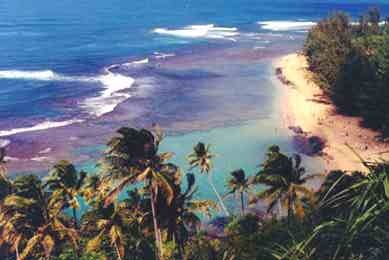 It is accessible only by ocean craft or the Kalalau Trail that begins at road's end near Kee Beach. 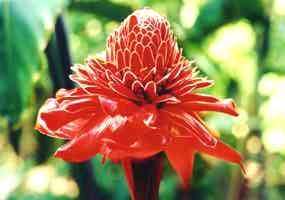 Parts of The Thorn Birds and South Pacific were filmed in this region. Kauais north coast has long been a favored location by film makers for blockbusters like Jurassic Park and Raiders of the Lost Ark, Elvis flicks like Blue Hawaii and Girls! Girls! Girls! and a potpourri of hits and misses like Hook, Lord of the Flies, Body Heat, Fantasy Island, King Kong, Honeymoon in Vegas, and Seven Days and Six Nights. Helicopter view of the Na Pali Coast One morning we hiked two miles along the Kalalau Trail, following the Na Pali coastline to Hanakapiai Beach, up and down hills, around switchbacks, and along slippery ridges that offer eye-popping views. From Hanakapiai, it's two more miles to Hanakapiai Falls. Hikers following the Kalalau Trail beyond Hanakapiai must have permits. Be prepared to be impressed. Although Im deeply familiar with the beautiful U.S. West Coast, and have traveled the length of the U.S. Atlantic coast, Kauais north shore is the most powerfully spectacular Ive encountered. 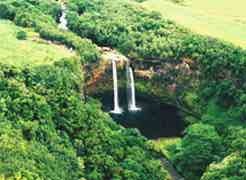 There's so much to see and do on Kauai. As much as we did, wed wished we had time to do.more. We enjoyed a tour of the National Tropical Botanical Garden, a visit to Kilauea Lighthouse, an "aloha wear" shopping spree at Hilo Hattie's, and a 70-minute helicopter ride. The copter ride was my wife's first-ever flight, and the scenery left her blabbering like Daffy Duck. Spendy, yes, but flights truly offer views for "soar" eyes. The best activity? Hard to choose, but one of our favorites was kayaking along the Wailua River. We paddled about 2-1/2 miles from the rental shed to a pullover at a side channel. From there we hiked a mile to a pond, where we dove in and swam a short distance to a long-lipped waterfall, surrounded by cliffs and hanging ferns. On the paddle back we detoured to Fern Grotto, a verdant tropical spot that's a favorite destination for boatloads of tourists and the scene of many weddings. Unlike some trips, where a week's stay seems more than enough, our visit whetted our appetite for more. More day hikes, backpacks along the Na Pali Coast and into Waimea Canyon, and another river paddle. We're planning a backpack along the length of the Kalalau Trail. We'll consider staying in the rustic Kokee Lodge cabins or camping at Kokee State Park, so we can get early morning starts for longer hikes into Waimea Canyon. That future visit, like the one past, will include laid-back afternoons on beaches and driving explorations of the island's distinct regions...and, of course, more samplings of shave ice. Click here for details to plan your own trip to Kauai.